I’ve always felt a funny feeling in my stomach whenever I’ve heard the expression “technical communication is an art and a science”. It’s because there’s something about this expression that, although true, is meaningless. Selling is an art and a science. Teaching is an art and a science. Business is an art and a science. If so many professions, indeed if all professions, are both an art and a science, then does it really makes sense to single out ours? The problem runs deeper than this, though. What exactly does it mean when we say something is an art or a science? Could they, in fact, be two sides of the same coin? To explore this, we need to be extremist. What is the most extremely artistic profession you can think of? How about, oh, an artist? Of course, there’s many different kinds of artists, but when I envision one, I see a French painter wearing one of those annoying puffy blue hats, and having consumed enough alcohol to knock out a small horse. A painter certainly certainly needs to be artistic, so it’s self-evident that art is an art. Artists have to be creative, inspired, and imaginative. They have to be non-scientific and see things in an emotional, spiritual, and meta-physical way. Artists are often extremely emotional, sensitive and irrational; it’s no wonder that many of them abuse drugs, are depressed and leave this world all too soon. Science has shown that the mind actually expends energy filtering out much of what we sense so that we don’t become overwhelmed. Artists seem to have a malfunctioning filtering system that lets in everything pour in. As a result, artists create great art, but have a nasty habit of killing themselves, which does not look too good on a resumé. But is art only an art? Look at the other areas that a successful artist needs to know. They have to learn about composition, colour, light, paints, brushes, and canvasses. They need to study techniques, styles, media, forms and textures. They should learn about the lives and history of other artists and artistic eras. And if they actually want to make a living as an artist, they had better learn the business of art: the gallery system, the curators and critics, and the art journal editors and writers. They must learn how to develop, schedule, package and present showings, and deal with those pesky clients. These things are not art, but the fact-based technical side of art – the science of art. 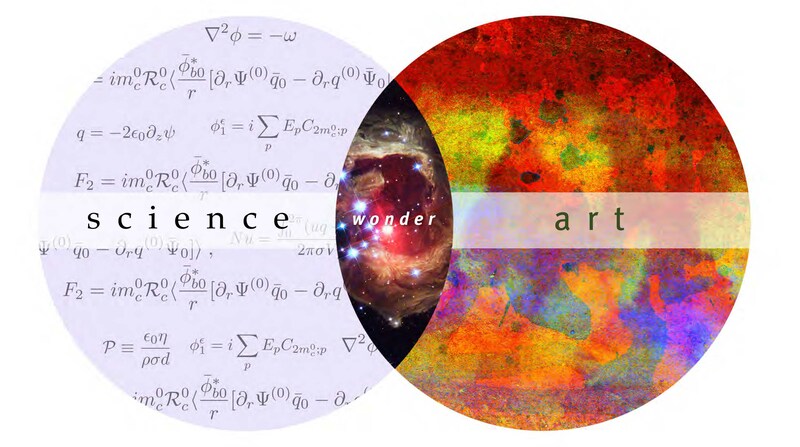 Therefore, art itself is both an art and a science. Science, of course, requires enormous technical, scientific and mathematical knowledge. It requires a cold, hard analytical view of the facts, with no emotion. It requires observation and testing of readily available data. It’s not very artistic – or is it? When Newton saw an apple drop, he “discovered” gravity. Edwin Hubble, using creative experiments, proved that the universe was expanding. Einstein, perhaps the greatest scientist of the modern area, would imagine himself riding a beam of light, and from that was able to envision his Theory of Relativity. To say that science does not require innovative, creative thought is nonsense. A scientist who is not creative will never be able to discover new things. That’s why the history of science is one in which one model of reality being replaced with a newer one, until that one is itself replaced. Science, therefore, is also an art. If science is an art and a science, and art is an art and a science, where does that leave our profession? Right where we started, as both an art and a science. Technical communication: It’s an art. It’s a science. It’s a scientific art and an artistic science. This entry was posted in science by Andrew Brooke. Bookmark the permalink.